Road Trail Run: Review: Orange Mud No Bounce HydraQuiver Single Bottle Run Pack. 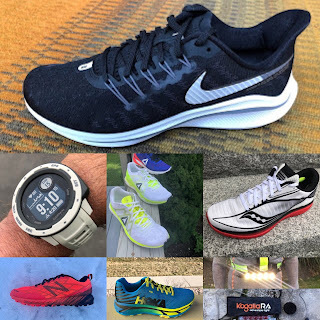 Review: Orange Mud No Bounce HydraQuiver Single Bottle Run Pack. We all struggle with the best way to carry an adequate amount of water and supplies (gels, phone, light jacket) for those 1 to 3 hour runs. 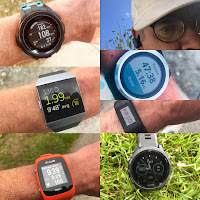 Some such as yours truly, prefer not to carry bottles in hand, are bothered by tight belts and bouncing bottles, hate to fiddle and twist while grabbing bottles on the run while others find that race vests chafe or are uncomfortable. The Orange Mud HydraQuiver is an ideal solution to all these issues. Instead of carrying water on the waist or wrapping around the front with pockets on the chest as some vests do, the HydraQuiver puts its included 24 oz water bottle high in the middle of your shoulder blades. No bounce. Very easy to grab to grab the bottle and then replace into a nice stiff holster. 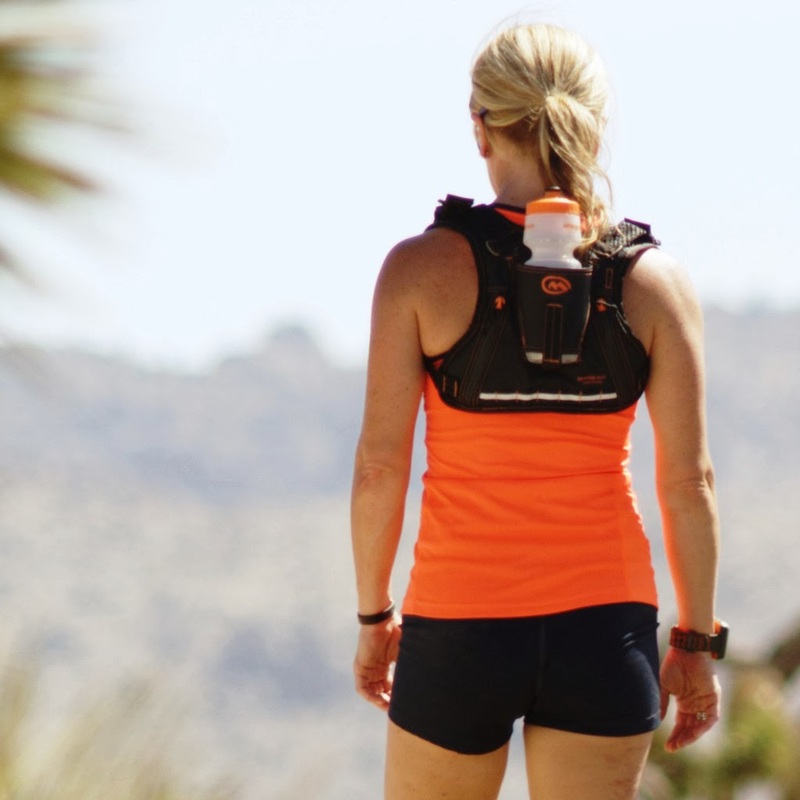 The HydraQuiver is more than a bottle carrier, it's also a great little run pack. Read on for the details. There are 2 stretch mesh pockets on top of your shoulders for gels and a smartphone. In the picture below (2013 model) I have 3 gels in one pocket and an iPhone5, just, in the other. The pockets load from the bottom and have very secure industrial velcro. "2014 has slightly longer shoulder tongues ( helps shoulder comfort for large framed people while no sacrifice to small), spandex nylon knit on the shoulder pockets to fit larger smart phones, more gels and easier entry for items, shorter nylon webbing so less to flop around (still elastic keepers on the end of the shoulders), reflective logo on the back, new diamond pattern material, new tie down area on bottom of pack, new headphone laser cut port, and slightly lighter than 2013. " In addition to the bottle carrier the back has a double (zips from each side) zippered pocket to hold your phone and a light jacket. There is a pass through port for headphones. The shoulder strap webbing is super soft. I have had no chaffing problems to date. It does fit snug under the arm pits. Orange Mud does not stop with the HydraQuiver also available in Pink. They offer The Double Barrel Quiver, a 2 bottle Quiver that as the bottles are angled I found a bit harder to re holster as well as thigh Quiver for stand up paddle board. I also have reviewed their Transition Wrap, a fabulous way to pull off those parking lot clothes changes and a great way to protect your car seats from sweat. All products made in the USA of very high quality materials. As a gear geek I can tell the noticeable difference when the velcro is top grade, the webbing super soft, and manufacturing top notch. Orange Mud is a wonderfully inventive company. Bounce proof easy to reach bottle carrier. High quality materials and construction. Made in USA. Somewhat pricey at $84.95 but comparable in price and function to competition. Some may find the bottle on the shoulder look goofy, I don't. Disclosure: HydraQuiver provided at no charge as a review sample.